Histological techniques 4. Sectioning. Paraffin microtome. Atlas of plant and animal histology. Microtome for obtaining sections from paraffin embedded samples are probably the most used apparatus in the histology labs. It has a blade, a sample holder and a mechanical device able to move the sample toward the blade at selected steps of a few microns in length, and then gets the section. Figure 1. Paraffin microtome with rotary mechanism. There are two basic types of paraffin microtome: rotary and sliding microtome. 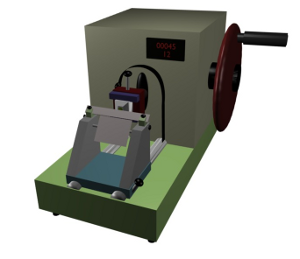 Rotary microtome (Figure 1) transforms the rotation movement into an up and down movement of the sample, and in each upward movement the sample holder draws near the sample toward the blade a distance selected by the user. The holder has built in a mechanism to orientate the surface of the sample relative to the blade. During sectioning, the blade maintains a fixed position, but the initial position and angle can be regulated. This angle is the angle of the blade with respect to the surface of the sample block. 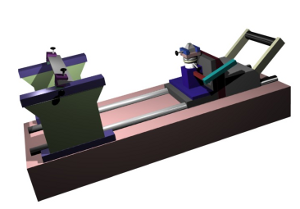 Sliding microtome (Figure 2) is able to cut sections by moving the blade over the sample holder, or the other way around. The movement is by hand, forward and backward. It is before the starting of the forward movement when the paraffin block is raised, or the blade lowered, a selected distance that gives a section thickness. Figure 2. Paraffine sliding microtome. Rotatory and sliding microtomes have both advantages and disadvantages. Rotatory microtomes are more precise and get uniform sections more easily. Some rotatory microtome models come with an electric engine for automatic sectioning. The mechanics of sliding microtomes is simple and the disposition of the pieces allows obtaining sections from larger surfaces (larger paraffin blocks). Celloiding blocks (another embedding medium) can be cut in these microtomes. However, sliding microtomes are not used much in histology labs nowadays. The paraffin block is trimmed before obtaining the first section (Figure3). We must "sculpt" the paraffin block in order to make a truncated pyramid with a trapezoidal upper surface, the surface to be cut. It should be trapezoidal because the longest edge of the upper surface is the firs to be cut, whereas the smaller edge will be the last. Both edges need to be parallel. In this way, the large edge for a new section displaces the previous section, which is attached to the blade by the shorter edge. Because both edges are parallel, long and straight rows of sections can be obtained in this way. Before we get to the embedded tissue, the paraffin between the sample and surface of the block needs to be removed by trimming, first by hand and latter with the microtome by making sections until the first section with tissue appears. FIgure 3. Trimming the paraffin block for obtaining tissue sections. Before cutting starts, the angle of the blade must be adjusted. This angle determines orientation of the surface of the blade compared with the upper surface of the truncated pyramid. It is usually set to about 10 degrees, although it can be changed depending on the sample features. Sections can be obtained in long rows because the short and large edges of adjoining sections are attached (Figure 4). The rows are manipulated with small brushes or lancets. Before placing the sections onto the slide, they must be extended, so our tissue has no grooves or folds. Because of paraffin hydrophobicity, sections can be placed on the surface of hot water (about 35 to 40 ºC). In this way, sections are stretched, but paraffin is not melted, which happens at about 60 ºC. The expansion of sections can be done in heated water baths or in heating plates. I the first case, the sections are directly placed onto the water and, once extended, transferred to the slide. 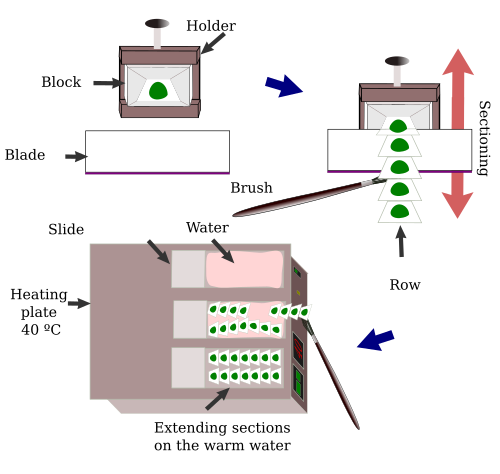 In the second case, the slides are placed on water that covers the upper surface of the slide, which was previoulsy laid onto the heating plate. Figure 4. After the truncated pyramid has been made and paraffin before the tissue has been removed, rows of sections can be obtained with the paraffin microtome. Sections are then extended in warm water (30 - 40 ºC). The water can be placed over a slide, and the slide onto a heating plate. Slides have been previously treated with an adhesive substance to keep the sections attached once the water is evaporated. The surface of the slide where the sections are placed needs an adhesive coat for keeping the sections attached for further processing. Slides are immersed in solutions containing gelatin, albumin, or commercial substances that make possible the adhesion of the tissue section to the crystal slide. Treated slides can also be purchased. Once the water is evaporated, the rows of sections remain extended on the slide, and then they are dried thoroughly in an oven at about 35 to 40 ºC overnight. After they are completely dry, they are ready for histological processing.